Double Dollars program. 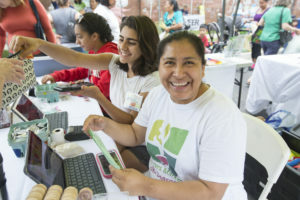 This is a program that allows shoppers to use federal subsidies like WIC and food stamps to purchase fresh fruit and vegetables and the CCFN farmers market matches it. So – a woman walking over to the market hoping to spend $20 to buy fresh food, now has access to $40 worth. Incredible. 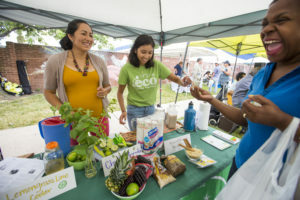 “This creates an immense opportunity for low-income families that might not otherwise have access to these foods,” explains Christie Balch, the Executive Director of CCFN. CCFN were pioneers of the Double Dollars program. 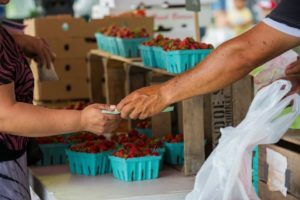 Currently, more than 500 farmers markets across the country have adopted a similar model. The marketplace has so much to offer. From fruits and vegetables and prepared foods to Central American crafts,there is an incredible selection. There is a lunch market. Honey and flowers are also sold at one of the 17 vendors. With local farmers that sell and produce their own goods, the vendors are a close community. There is a 125 mile radius for production and the average is 75 miles. In fact, the closest farm is only two miles away selling Central American herbs and crops. Michelle Dudley is the manager of the farmers market, and she hired Rosa Sanchez, who will start her 10th season at CCFN this year. Sanchez is a local farmer and an amazing entrepreneur. Most of the vendors and shoppers are immigrants. When CCFN first started, many did not think it would work. “It’s hard to plop down a farmers market and have it succeed, not to mention one like ours,” says Balch. It was something the community wanted and to see it evolve as almost a gamble, was very cool. Balch thinks that the founders did a really good job of hiring people, something that clearly continues today. Seeing a need for developing the vendor skill-set, CCFN created Takoma Park/Silver Spring Community Kitchen. Many women had interest in becoming a vendor and start a food business. Some even had business experience in their home countries. Located in the nearby Presbyterian Church, the Health Department comes and teaches classes. The interested students needed a licensed kitchen space to help develop skills so that they can eventually launch their own businesses with the proper training. The Microenterprise Training Program – for food businesses specifically. There is a thirty-hour training offered in both English and Spanish. It’s free. You have to apply. The kitchen opened last August and so this program is really fledgling. Balch counts 11 businesses that have been accepted thus far and they will continue to accept more this year. To complete the circle, many of the students and vendors buy and sell from each other. Helping out CCFN comes in many forms. Come shop at the market once it opens in spring. Do Zumba and try some free samples. Join the incredible CSA and xperience the food for yourself. You will be supporting local farmers and their families. Check out the volunteer opportunities list on the website. It’s quite extensive and has many different program areas. Apply to some and become a regular volunteer. Hire kitchen users for catering needs you may have. Finally, monetary donations are always accepted and encouraged.